Baz Luhrmann's dazzling and unconventional adaptation of William Shakespear's classic love story is spellbinding. Leonardo DiCaprio and Claire Danes portray Romeo and Juliet, the youthful star-crossed lovers of the past. But the setting has been moved from it's Elizabethan origins to the futuristic urban backdrop of Verona Beach. Baz Luhrman's "Romeo+Juliet" is a dizzying spectacle to watch. It's like an MTV music video on steroids combined with a campy LSD trip. The battles between the Montagues and Capulets are taken straight from Hong Kong action flicks. Leonardo diCaprio is convincing,albeit in his own way,as the pretty boy Romeo Montague. Claire Danes,as Juliet Capulet, lives her so-called life on Verona beach when she finds passion with Romeo.In terms of looks, they're perfectly cast. However, they don't imbue William Shakespeare's lines with the passionate fire he intended. In my personal opinion, I believe Shakespeare's writing is way too obscure and out there, and when hearing people say "Shakespeare wrote for the common people", I can only cringe in terror at what plays written for educated people must have sounded like. This movie doesn't change the dialect or dialogue of the movie, and gives it a weird sort of artistic modern setting, which makes it not only a surprising and original twist, but makes it much more watchable to see a timeless tale truly tested with its claim to timelessness. Even if it took place in the year 3010 AD, it'd still be the same. I love the way the adults on the newscasts and police speak, and the way the police officer at the end of the movie scolds the Capulets and Montagues, and the beginning scene, with the Montague nerds biting their thumbs at the Capulets was amusing. Harold Perrineau as Mercutio is spellbinding, and John Leguizamo is equally spectacular in this movie. What keeps this movie from being a great one in my opinion is the two lead characters played abysmally by Leonardo DiCaprio and Claire Danes. DiCaprio, normally a great actor, sounds like he's just memorized the lines and is reciting them like a schoolchild forced to read them aloud in class--lifeless, with little to no emotion, and an apparent lack of understanding as to what he is saying. Claire Danes is even worse, delivering lines in such an awkward manner as to make me cringe. It sounds literally like a giggling, bubbly school girl reading from a script for the first time while distracted by something else. There's a lot more screaming at the maid's hand and Juliet's mother, though thankfully it's limited just to that scene and scarcely any other. But it is SERIOUSLY annoying having her scream like that when Juliet is CLEARLY shouting back "By and by I come"
All in all, the show is all but stolen by John Leguizamo and Harold Perrineau as Tybalt and Mercutio (respectively), while the lead actors are weak in their roles. I was a gawky twelve-year old when this movie was released in 1996. I was negotiating for the first time the treacherous battlefield of middle school hallways: the gossip, the insecurity, and the foreign sensations, the blushing flush of first infatuations. It was a perfect time for me to see this movie. I remember the breathless trailers. Rat-a-tat shots of gang gunplay, adolescent romance, bright colors, and explosions, all backed by a pounding, bass-heavy soundtrack. Suddenly the old Bard of Avon seemed cool. The theater was packed when I went. I recognized some kids from my school. The median age was probably 16. The lights dimmed. The screen flickered. The movie started. And off we went. Here was a world we recognized, a garish world of guns, trendy fashions, and solipsistic teenagers scribbling poetry in their notebooks. The audience snickered with recognition at Romeo's poolside pleading to Juliet, "Wilst thou leave me so unsatisfied?" And Juliet's retort, "What satisfaction canst thou have tonight?" Gunplay and drug use and raging hormones. Well meaning adults and over-possessive parents. It was so familiar, but heightened, transfused into grand opera. I'm no longer the wide-eyed innocent thrilling to Radiohead b-sides and drooling over Claire Danes (okay, not quite true). So how does the movie hold up? I'll be honest: I can't quite dissociate myself from the movie's nostalgic associations. But I'll try and be objective. What holds up surprisingly well are the performances. The supporting cast is filled out nicely with well-cast veterans and some fresh-faced newcomers. I love John Leguizamo's cocksure Tybalt, all pointy teeth and resin-lined voice. Harold Perrineau (now I can't help but see Michael from LOST!) is a surprisingly affecting as the cross-dressing, drug-dealing misfit, Mercutio. He feeds Romeo a suspicious looking pill (ecstasy? acid?) before the Capulet party, and the results are appropriately trippy. Pete Posthlewaite as Friar Laurence possesses the kind of natural ease with the dialogue that suggests many years of hard-won training on the boards. He wraps his lips around Shakespeare's Gordian knotted language as easily as if he were reading a grocery list--and with a put-on American accent! Since this film DiCaprio has proven himself a worldwide mega-star, headlining such moneymaking behemoths as Titanic and The Departed. Here he captures the passion, the poetry, and the primal rage that imprison Romeo at any given moment. He's a slave to his emotions. He spends his time scrawling poetry in little black books and looking fashionably disaffected. He drops Rosalind in an instant after a one-time encounter with Juliet. He kills Juliet's kin, Tybalt, to revenge his friend's death, his face twisted into a terrible mask of rage. Later, after exile, he dies by his own hand thinking Juliet dead. Ah, Juliet. Claire Danes. Okay, here's where the objectivity becomes difficult. She seemed like the epitome of mysterious older girl sensuality to me when I first saw this movie and now I'm writing from the perspective of someone a few years her senior when she made this movie. Hindsight shows that she doesn't have quite the same grasp and fluidity with the words DiCaprio possesses. What she does have is a winning smile and angelic features and an almost painful sincerity that broke so many hearts on the popular MTV program, "My So-Called Life." this movie is a modern interpretation of shakespeare's tragedy of romeo and juliet. while the dialogue stays faithful to the play, the visuals were modernized and some minor liberties were taken, most notably by exchanging swords for guns (named sword 9mm) and implied drug use. im not a huge fan of the silly beginning of the movie, but it quickly becomes more serious. i absolutely love the art direction and photography in this film and while im not a huge dicaprio fan, his acting is very solid with glimses into pure brilliance. his most moving scene is when he confronts and murders mercutio after tybalts death. Well, I must say that this picture was quite an eye-popper. Director Baz Luhrman has used every fast-cut camera angle, bright color, zoom, pan, fast-action trick in the book to keep this story moving along at a rapid, psychedelic clip. It really is worth seeing, just for the director's vision, in the same way that Julie Taymor's interpretation of "Titus Andronicus" is worth seeing (if you can stomach it). Hard-core Shakespeareans may cringe at some of the textual editing - e.g. Romeo saying, "thy drugs are swift" not as he dies at the end, but as he pops a tab of acid before going to the Capulet's costume ball. That kind of stuff is unnerving, but you have to deal with text editing in any version of this play. I had a hard time getting behind Leonardo diCaprio and Clare Danes as the lovers in this one. Maybe it was their totally American accents. Totally. Or maybe it was the fact that they just came off as a couple of spoiled, bored kids looking for a thrill. But then again, maybe that's what R&J are. Spoiled, bored kids looking for a thrill. Or maybe it's because I'm getting older, I dunno. The real stars of this picture are the supporting actors, particularly John Leguizamo as a lithe and menacing Tybalt, Miriam Margolyes as a thick-waisted Mexican Nurse, and Harold Perrineau as a flamboyantly light-in-the-loafers Mercutio. Those people were very, very fun to watch, and worth the price of admission. I hadn't watched since the 90's. Forgot how the movie started off. Once it gets goin, this is an interesting if not completely over the top rendition of the Bard's classic. Made me give Shakespeare a Second Chance! "Gregory, on my word we'll not carry coals." "No for then we should be Colliers." And if you were like me you said "What the hell are they talking about? This isn't as good as all the hype it gets!" But when you watch this movie it turns that story into the epic romance that everyone says it is, and probably what you thought it was before you read it. That, and the new setting and actors takes some of the cheesiness away from those cliched lines. Let's face it, " ... and Juliet is the sun." has way more impact when Leo DiCaprio says it, than when you read it. Also the lines are the same, but easier to interpret when in a modern setting. I'm not saying that the Zeffirelli version is bad or anything, but it can get slow at some points, and because of the medieval setting it doesn't make the lines much easier. That, and an interesting costume design for the guys in that movie seems to involve cups that they wear on the outside of their pants. It makes it kinda hard to take seriously. But it is still a great movie! Don't get me wrong! That and It has a stuck-in-your-head soundtrack that adds a whole new level to the movie. It also has a cool, artsy vibe to it that can seem overdone to some, or original to others. I didn't even like this story for a while, but now I want to read Romeo and Juliet again, with a better understanding of the lines. I just wanted to mention some of my favorite moments and ones to look out for. The actor who plays Mercutio (even in all his ridiculous cross-dressing scenes) still gives me chills during his eerie Queen Mab where he almost seems psychotic, but it captures your attention. Another moment is when Romeo confronts Tybalt after he kills Mercutio. "Either you, or I, or both of us!" is repeated, and shows this great moment of acting where he changes from distraught to furious. The last is the flashback scene when the commit suicide. In a moment that I usually don't find touching, the flashback to the moment they met, and another couple of cute scenes. It was really cute and sad. Say What You Like, But My Students Love It! For decades folks have been setting the Bard's plays in modern times, and with varying degrees of success. This one fails so badly that more tears will be shed over the poor acting and mangled dialogue than over the actual plot. Both Romeo and Juliet are in over their heads in this movie. Shakespeare's language can still be spoken in a way that is understandable when its natural rythmns and accents are correctly utilized. DiCappril especially seems to have no idea half the time what the words actually mean that he is speaking. And Claire Danes as "Juliet" is even worse. 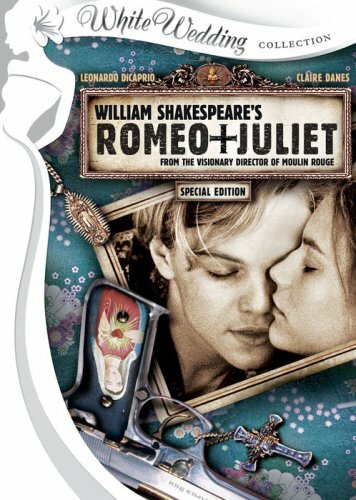 I purchased the Romeo and Juliet DVD with Olivia Hussy for my daughter for her 15th Birthday. I had seen this when it originally ran in theaters back some 30 to 40 years ago. Wonderful that my daughter and I can now watch this and enjoy it together today because she is very into Shakespeare and all his works but especially Romeo and Juliet. She is also a great fan of Leonardo DiCaprio so I purchased the Special Edition for her also. She watches and enjoys both and I had the experience of watching the DiCaprio version along with her for the first time. So nice to be able to share something with my teenage daughter that we enjoy together. Her music and other interests are really not too much of this mom's thing. As a high-school teacher for English foundations, I try my best to expose my students to the literature their peers in regular English classes receive. I must utilize movies as a visual aide supplement to help them connect with the characters, setting, dialogue... I strongly recommend using this dvd to support your curriculum to teach on all levels of student learning (auditory, kinesthetic, visual). As a person who grew up reading Shakespeare, watching plays based on his works, reading/comparing the original to other productions (West Side Story, China Girl), I must say I absolutely LOVED this movie. William Shakespeare's classic `Romeo + Juliet' is probably one of the most influential pieces of literature ever recorded. You can feel its presence and influence breathing life into just about everything we read, watch or listen to these days. With a tale this classic, this important to modern cinema it becomes something a bit wary to tackle it at its core and `remake' it from scratch. One may be a tad hesitant to embrace its new shape and form and rightfully so. When you look at the track record for remakes it becomes apparent that in general what was once golden should be left well enough alone. In Romeo + Juliet's case though this is a reimagining so magical it surpasses the original and becomes a momentous piece in the history books of cinema. Yes, Baz Luhrmann single handedly breathes a whole new life into this adaptation, handing to his audience a masterful and experimental film that never lets us out of its grasp. The first thing that Luhrmann did right was stick to the original text. A lot of people initially balked at the fact that the dialog was not updated along with the setting but I felt that artistically it was a much grander feat to have the original dialog kept intact. The fact that each and every actor slips into this way of speaking fluently and without issue is an ode to some great talent indeed. No one seems out of place of phoning it. Each and every actor handles the difficult wording marvelously. The next thing Luhrmann did right was trashing his setting. What I mean by this is that he didn't go the easy route and make this posh and beautiful but rather he played everything down, creating an almost gritty and dirty feeling to the surroundings. This is the future and the future is bleak. The best thing that Luhrmann did though was casting Leonardo DiCaprio and Claire Danes in the lead roles. At the time DiCaprio was slowly becoming a credible actor and Danes was just becoming known. Neither of them were quote-unquote household names or completely bankable yet but they both had proven they could act. Here though we get to see how well. To this day I still firmly believe that this is Leonardo's finest performance. Both he and Danes masterfully command their characters. Never has Romeo or Juliet felt so alive, so real and so relatable. Their tragic love affair is so enthralling, so captivating and so breathtaking. There are moments between them of pure beauty and strength that I'm appalled their performances didn't garner more awards attention. The rest of the cast is equally as impressive, especially the likes of Harold Perrineau (of `Lost' fame) who plays Romeo's best friend Mercutio. His performance is outlandish and flamboyant and adds a lot to the atmosphere of the film. John Leguizamo is memorable as Tybolt, Juliet's cousin, and Pete Postlethwaite is wonderful as Father Laurence. Paul Sorvino stands out for me as Juliet's father Fulgencio Capulet. His performance is brutal and intense and sends chills down my spine in scenes. A fresh spin on Shakespeare's classic, 'Romeo and Juliet,' this film brought to life what was merely words on a page during high school literature class. Garnished with colorful, neon settings and fairytale-like costumes, this film did a wonderful job of respecting Shakespeare's original dialogue. Backed up by a modern-day soundtrack, I highly recommend this film as an aid for teaching classic literature to today's youth. The chemistry between Romeo (Leonardo DiCaprio) and Juliet (Claire Danes) is the glue that holds this production together. Their playful, young love for one another is displayed perfectly throughout the film, and the colorful setting and props only add to the romance. I especially love the director's spin on the balcony scene, relocating it rather to Juliet's in-home pool. As Juliet, Danes maintains a character of innocence with intelligence, a balance I think Shakespeare originally intended for the young Capulet. As Romeo, DiCaprio displays an ever-convincing soul torn by lovesickness - every lady's dream come true. Honestly, in all of his films, I've never seen the boy act so incredibly in love as in this movie. Their chemistry, combined with that of the full cast, makes this film truly unique in itself. Let me begin my review by addressing those who are undecided whether to purchase this version (Luhrman) or the Zeffirelli. There seems to be a bias amongst educators (bordering on the arrogant) that the Luhrman version is somehow less "authentic" than the Zeffirelli. Simply performing "Romeo and Juliet" in doublet and hose, however, does not make it any more "Shakespearean". In fact, I would argue that modern-dress is more in keeping with the spirit of the original as Elizabethan drama had no elaborate sets or costumes; doublet and hose WERE modern-dress in Shakespeare's time. If we discount "updating" as a reason to discount the Luhrman version (which in my experience is invariably the excuse), we have to judge the movies on how well they illuminate/connect/inspire Shakespeare's words for our students. In my opinion, the Luhrman version does a better job of this than the Zefferilli. First, the updating works (for the most part). My students clearly understood gangs and rivalries; presenting the Montagues and Capulets as such, eliminated questions as why the two families hate each other or how the feud got started (answers which are outside the text). The guns and cars appealed to the boys; the love and romance appealed to the girls. My students could see themselves in the context Luhrman provided; they could relate to what was going on screen as present and relative, not merely events from 400 years ago. Secondly, casting famous actors (DiCaprio and Danes) as the leads hooks many of my students at the beginning. They watch the movie BECAUSE Leonardo DiCaprio is in it, but soon the magic of the Bard's words (which they struggle to follow at first) keeps them interested. DiCaprio IMO is uneven; some scenes he performs better than others. Danes's performance (other than her fake crying in the Capulet vault) was generally strong and very believable; her words did not seem "acted" but rather natural. The supporting cast was also very good with Tybalt and Benvolio standing out. There were some scenes that didn't work well for me. The Capulet ball in particular was strange. Mercutio came dressed in drag and this (unfounded) homosexual subtext was amplified by him prancing around on the stairs with some Chippendale dancers. Just plain strange. Also, the Queen Mab speech was weird and luckily cut short; Luhrman did try to tie it into the events as a sort-of intoxicated rambling at the "pre-party" (complete with Ecstasy) before Romeo crashes the ball. Another weak performance was Lady Capulet who played it for laughs (which again I couldn't see from the text), and it was an unconvincing performance played that way. The only time Lady Capulet seemed believable was when she played it serious (Tybalt's death, the argument with Juliet and Capulet). Some students also didn't care for all of the musical numbers, but most liked how Luhrman tried to include contemporary songs into the movie. My friends and I call this the DiCaprio version, and boy is it amazing! I think perhaps this movie is a 5 star or a 1 star - in other words, you either love it or you hate it. I definitely loved it! This movie steps away from the traditional ideas of Romeo and Juliet and delivers something completely new. Sure, seeing DiCaprio spouting Shakespeare takes a bit of getting used to, but once the original shock subsides the plot just takes over. The amazing thing is that Leonardo DiCaprio and Claire Danes actually manage it. They pull it off! Romeo and Juliet cease to be the protagonists of an archaic, dusty, old romance and become real people with real love. One other thing, often overlooked: the music! Each song is perfect for each scene - adding just enough, never distracting and never taking away. The trailer parks and custom hot rods notwithstanding, this movie features some of the best acting I've seen in quite some time. I've read the book many time and have never felt closer to the characters than I did with this production. I wanted to hang out with Benvolio and Mercutio, I wanted to ride with Romeo and watch his love for Juliet grow into a montrous thing that would take both their lives. I wanted to hate and fight Tybalt and the rest of the Capulet boys but at the same time understood their thought that Romeo's appearance at the party was an affront to them.